Playdom’s Sorority Life is an addicting social game where players become young college girls pledging for a sorority house. Attend special events and hold down a job to support a lavish lifestyle. Players enter a virtual world where confidence, style, and status are everything. Go shopping for glamorous clothing and accessories. Snag a boyfriend. Buy a hot ride. Similar to games like Mafia Wars, Fashion Wars, or It Girl sisters can attack each other and initiate fierce walk-offs. Only the most stylish and influent pledges are victorious. In this article learn the best Sorority Life tips for winning fights, increasing glam, gaining more sisters, and leveling up fast. Discover effective cheats for the costume party and other difficult to master events. A sorority is useless without lots of sisters. To advance quickly in this game players need as close to the maximum limit of 500 sisters as possible. Friends increase the strength of the house boosting your ability to win fights and level up easily. Send friend invites, post a comment on the site homepage, blogs, or online forums dedicated to the game for active players to add you. Strength is in numbers. When starting out concentrate on boosting the max energy level of your character. This will enable players to socialize more resulting in leveling up faster. After reaching level 10 skill points can be distributed between charm, popularity, confidence, and stamina for effective attacks. Focusing on energy first is an easy to do Sorority Life cheat. Boyfriends, cars, accessories, and fashionable clothing are essential. All the members of your house need to own at least one of each to form a strong unit. Send free gifts to those unfortunate and always upgrade when able. Remember brownie points for buying popular glam items can be earned through completing free offers. Pay attention to the offers in order to avoid scams. Only select the ones that appear reasonable. Never give out all of your personal information. One of the best Sorority Life tips for leveling up fast is to perform the costume party repeatedly scoring high. A whopping 5 influence points is rewarded each time. The costume party event can be difficult to master. 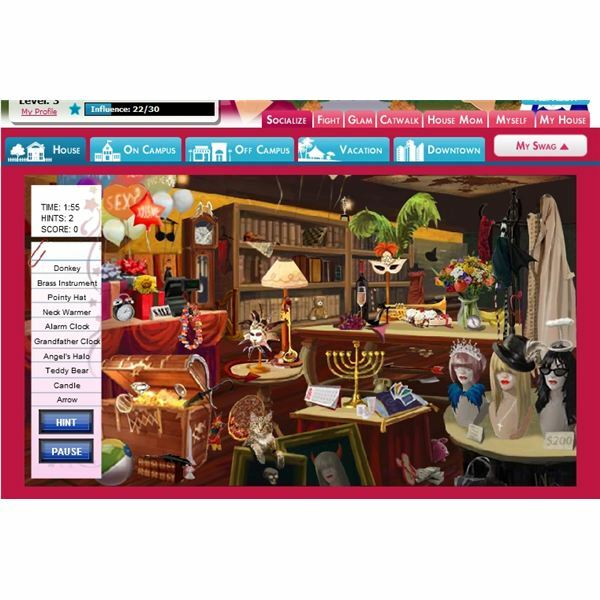 A picture with hidden objects appears. Players are timed and have to quickly locate the items from the drop down list. Although it seems like a simple mini-game it’s not easy. The photo is overflowing with random items distracting the eye. Users should aim to find all ten items for the biggest reward. Since the costume party event can be done several times on the first try take a few seconds to snap a screenshot of the scene. Stop the game and study the picture. Find the pointy hat, alarm clock, candle, and all the other items. Memorize their locations. Then log back into the game. Being aware of the object’s location ahead of time make it easy to score high. Following these Sorority Life tips and cheats will make you Alpha Delta Pi in no time. What is the World of Darkness and Who Would Enjoy It?